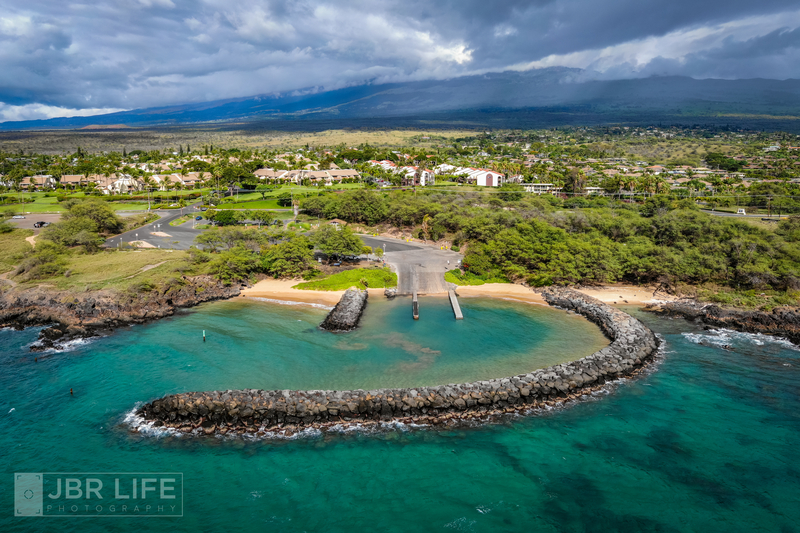 Today I'm sharing a photo of Kihei boat ramp...a little spot on Maui's south shore where many adventures begin and end. Boats leave from this ramp to take tourists (and locals) on snorkeling, whale watching and fishing trips. It's a small spot, nothing fancy, just a ramp and dock. But it's one that I often enjoy photographing. This image was taken with a Mavic 2 Zoom UAV, which features a telephoto zoom lens that can be operated remotely. Unlike my normal multi-image pano shots, this image retains what you'd see at the widest lens setting (24mm). However, it was captured by zooming to 48mm and splitting the scene into 9 photos (3 column, 3 rows). I can see now that I'm going to be having way too much fun with this little drone! Good Golly Miss Molly, That's some serious detail!! Lovely histogram with excellent color distribution. Moody skies. Wonderful harbour as the hero. Nicely accented by the city/mountains/sky. Really, really well done and a great candidate for a ginormous print! Terrific shot. I applaud your work with the drones.....gives me looks at Hawaii that I've never seen before. Years ago, I shot a lot of video of the goings on at several local boat ramps. I got some of the most hilarious clips you'll ever see of inexperienced boaters trying to get their rigs in and out of the water. Very nice! I'm not sure I understood your notes. Is this basically a pano of 9 exposures, controlled by the drone to mimic 24mm? This is a 9 shot pano, each shot taken @ 48mm, stitched into an image that would equate to a 24mm single exposure. In short, the drone is capable of auto executing the Brenizer method. Thanks, that's what I thought. This of course is not an example of Brenizer, but of a straight multi-row pano. True, as I understand Brenizer requires a fixed focus on the primary subject, so as to create greater depth of field, yes? Ryan Brenizer designed his method as a way to gain greater control over limited DOF, typically to create a very gradual bokeh transition. It was originally used strictly for portraiture, often for a single subject or two subjects. I would rather call your image a "Highly Detailed, Arial, Stitched Scenic". Oh man how I miss the freshwater boat ramp days!! I used to be an avid bass fisherman, getting on water at least 3 days a week, for years on end. But I'll tell ya', every single holiday, I left the boat at home and still went to the ramp for the exact reason you just stated. Good stuff!! !